Rockford Brownstone Publishing has just introduced a new book to rave reviews from author John Montandon. In his premier book, By His Own Blood, Mr. Montandon discloses the incredible true account of his father's horrific death and his search for answers and healing. Announcing the premier of Jon Montandon's new book, BY HIS OWN BLOOD. This book has it all. Well developed characters. Humor. Suspense. And a unique storyline. Rockford Brownstone Publishing has just introduced a new book to rave reviews from author John Montandon. In his premier book, By His Own Blood, Mr. Montandon discloses the incredible true account of his father's horrific death and his search for answers and healing. In the story, the writer’s father, Doc Montandon, was subjected to unnecessary exploratory surgery at a local hospital, given a blood transfusion tainted with the HIV virus, and was refused treatment after having developed AIDS. To make matters worse, the ordeal was covered up by the same medical authorities. Doc, a retired Texas cotton farmer, suffered terribly and died not knowing why or how he was infected. At a time when people were frightened to even talk about the word “AIDS” and the social stigma attached to the disease was damning, Doc’s death and the effect on John Montandon and his family was devastating. 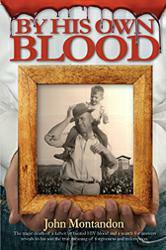 By His Own Blood begins as a story about Montandon’s growing up on a small farm and the positive influence Doc had in shaping his son’s life. It is about the prejudices that affected everyone in rural Texas in the 50’s and 60’s. And it is the story of how Doc’s legacy of bedrock religious principles and character allowed the author to eventually experience and understand the forgiveness and redemption that could only come from his father’s sacrifice. Mr. Montandon has already received accolades and great reviews from the prestigious Los Angeles Book Festival, editors, screenwriters, and authors for his new book. Lori Handelman, PhD, a well respected New York professional book and manuscript editor said in her review of Montandon's book, "This book has it all. Well-developed characters. Humor. Suspense. And a unique storyline that has the reader inextricably and emotionally involved from beginning to end." Adds Steve Schwartz, L.A. Times bestselling author of Boulevard and Beat, “Montandon's prose is crisp and clean and this, his debut effort, proves he's a first-rate storyteller worthy of all the acclaim he will surely receive. There is nothing I didn't like about this beautifully-written, tender memoir." Other reviews that give high praise to Montandon’s book can be found on the By His Own Blood web site. The book and Kindle ebook are now available on CreateSpace.com, Amazon.com, and other online and offline retailers. Rockford Brownstone Publishing is located in Hermosa Beach, California, and is dedicated to developing and promoting self-published books, ebooks and audiobooks. To contact Rockford Brownstone Publishing, call 310.376.6502, send email to jmontandon(at)rockfordbrownstone(dot)com, or visit the web site at http://www.byhisownblood.com. Interested readers visiting the web site can sign up for a chance to win a free Kindle Fire featuring By His Own Blood.